So begins the greatest romance novel of all time. Austen's set-up is ingenious: Mrs. Bennet has but one aim in life: to find a good match for each of her five daughters. Mr. Bennet, a mild and indolent man given to witty cynicisms, refuses to take this vulgar project seriously; he ridicules his wife instead of giving her support in her schemes. One of the daughters, Elizabeth, becomes prejudiced against her future suitor, Darcy, because of his arrogance and his uncalled-for interference with his friend Bingley's courtship of her sister Jane. In interfering with Jane and Bingley, Darcy is influence by Mrs. Bennet's undisguised husband-hunt and her impropriety in general; he mistakenly believes that Jane is only seeking an advantageous match and that her feelings are not sincere. In spite of his disapproval of the Bennet family. Darcy cannot keep himself from falling in love with Elizabeth, and he proposes to her. 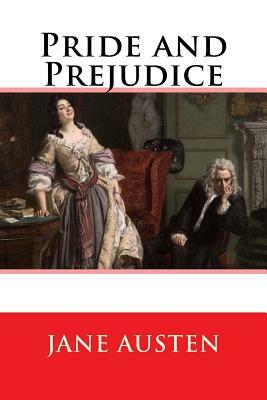 The tone of the proposal (it is evident that his love for Elizabeth is a blow to his pride) and her own prejudice cause Elizabeth to coldly reject him. Having set up the central misunderstanding of the novel, Austen then brings in her cast of fascinating secondary characters: Mr. Collins, the sycophantic clergyman who aspires to Lizzy's hand but settles for her best friend, Charlotte, instead; Lady Catherine de Bourgh, Mr. Darcy's insufferably snobbish aunt; and the Gardiners, Jane and Elizabeth's low-born but noble-hearted aunt and uncle. Some of Austen's best comedy comes from mixing and matching these representatives of different classes and economic strata, demonstrating the hypocrisy at the heart of so many social interactions. And though the novel is rife with romantic misunderstandings, rejected proposals, disastrous elopements, and a requisite happy ending for those who deserve one, Austen never gets so carried away with the romance that she loses sight of the hard economic realities of 19th-century matrimonial maneuvering. Good marriages for penniless girls such as the Bennets are hard to come by, and even Lizzy, who comes to sincerely value Mr. Darcy, remarks when asked when she first began to love him: "It has been coming on so gradually, that I hardly know when it began. But I believe I must date it from my first seeing his beautiful grounds at Pemberley." She may be joking, but there's more than a little truth to her sentiment, as well. Jane Austen considered Elizabeth Bennet "as delightful a creature as ever appeared in print." Readers of Pride and Prejudice would be hard-pressed to disagree. The novel contains two of Jane Austen's best-known minor characters, Mr. Collins and Lady Catherine de Bourgh. Jane Austen (1775 - 1817) was an English novelist whose works of romantic fiction, set among the landed gentry, earned her a place as one of the most widely read writers in English literature. Her realism, biting irony and social commentary have gained her historical importance among scholars and critics. Austen lived her entire life as part of a close-knit family located on the lower fringes of the English landed gentry. She was educated primarily by her father and older brothers as well as through her own reading. The steadfast support of her family was critical to her development as a professional writer. From her teenage years into her thirties she experimented with various literary forms, including an epistolary novel which she then abandoned, wrote and extensively revised three major novels and began a fourth. From 1811 until 1816, with the release of Sense and Sensibility (1811), Pride and Prejudice (1813), Mansfield Park (1814) and Emma (1815), she achieved success as a published writer. She wrote two additional novels, Northanger Abbey and Persuasion, both published posthumously in 1818, and began a third, which was eventually titled Sanditon, but died before completing it. Austen's works critique the novels of sensibility of the second half of the 18th century and are part of the transition to 19th-century realism. Her plots, though fundamentally comic, highlight the dependence of women on marriage to secure social standing and economic security. Her works, though usually popular, were first published anonymously and brought her little personal fame and only a few positive reviews during her lifetime, but the publication in 1869 of her nephew's A Memoir of Jane Austen introduced her to a wider public, and by the 1940s she had become widely accepted in academia as a great English writer. The second half of the 20th century saw a proliferation of Austen scholarship and the emergence of a Janeite fan culture.